Intersections: Could the anti-emo movement be good for emos? Could the anti-emo movement be good for emos? 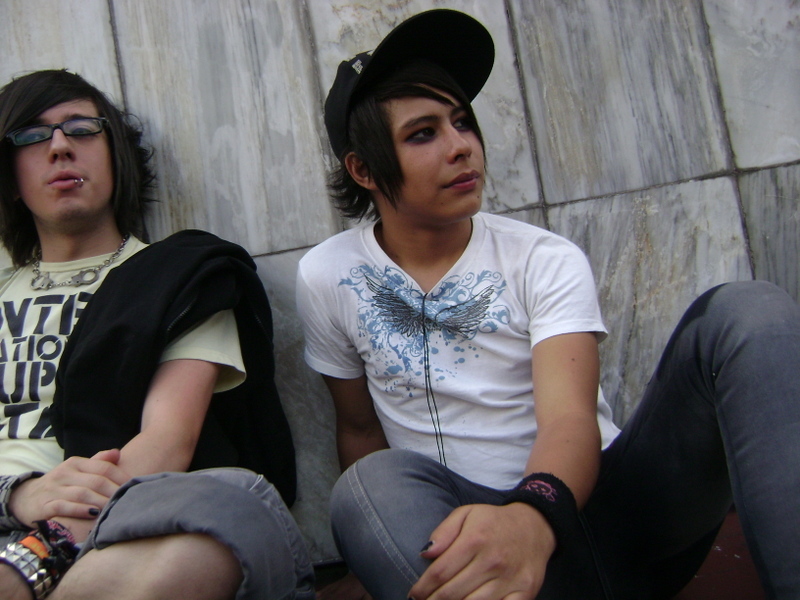 This is Adrian and Pablo, teen guys hanging out on Thursday at the now-infamous Glorieta de Insurgentes in Mexico City. It was calm today and, as expected, swarming with journalists gingerly making their way around the emo kids. "We've been hanging out here and no one's cared," Adrian said. "Now, there are cameras everywhere ..." -- just as another guy approached from a magazine, with a camera, asking to take a picture. The much-maligned emos of Mexico are now enjoying the world's attention and an outpouring of pity and good vibes from the local government, local rights groups, and the global media. And even D.F. 's well-organized punk movement? Possibly. One rumor I heard today said that on Saturday pro-peace and tolerance punks will rumble with anti-emo punks, once and for all. Could there be a backlash to the backlash? As for the kids whose iPods are packed with tracks by Alesana and My Chemical Romance, they profess they don't want to be bothered and don't want pleito with anyone. In fact, they have their own divisions. Many snicker at "posers" who've only recently begun wearing the emo style. Updates, as always, later. * More links and updates on the buzz in Tijuana over at LA Daily: "Emos prepare to rumble in Tijuana, march for peace in Mexico City."